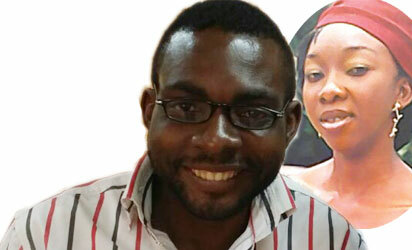 Dennis Akagha and his late fiance, Justina Ejelonu. See note at bottom about how the media doctored this photo. 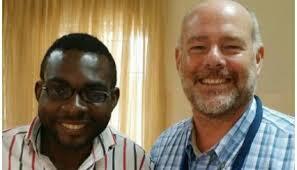 Vanguard Newspaper interviewed Dennis Akagha, fiancé of nurse, Justina Ejelonu who died from Ebola. She was pregnant and so her immune system was weak, which made it easy for her to contract the disease. On that first day which was a Monday, she was having some pregnancy symptoms, but I just encouraged her to go because it was her first day at work. Sawyer (Ebola source) was her first patient. The next day, Tuesday, she didn’t work on Sawyer. Wednesday and Thursday, she was off. Then on Friday, Patrick Sawyer died. They didn’t know he had Ebola, it was three days later that they realized it was Ebola. Initially I was not wearing gloves because I felt I had already been exposed to the virus. But later I cautioned myself and started wearing nylon on my hands. But I couldn’t stay away from her. I kept consoling her. Even when I took her to the hospital, she wanted to hold me and I told her to also consider my safety. She managed to hold herself and was able to find her way out in a pool of her blood. Justina was on the floor for 30 minutes before she was attended to. She was screaming that she was going to die. She was seriously bleeding, she had to come out of the taxi and lay on the floor. I ran around, trying to get doctors to attend to her. After everything, they took her in, took her blood samples and the following day, the result came out that it was Ebola. They washed the taxi with chlorine and also bathed the taxi driver and I with chlorine spray. 14 days after I was exposed to Ebola, my temperature rose from the usual 35.2 degrees centigrade to 37.2. The Lagos State government gave me a thermometer the day I dropped Justina off at the centre. It took them two straight weeks to visit my home and to disinfect it. Before they came, I had already done what I could do. I used bleach and detergent to clean the whole house, furniture and clothes inclusive. I contacted the virus because Justina was very sick and I was taking care of her without any appropriate protection. When we knew what we were dealing with it was almost too late for me as I had already contacted the virus. The Lagos State government sent health professionals to check on me regularly to know how l was doing or if I had the signs of the virus manifesting. So they used to come around to check on me. At some point the Nigerian Government officials created scenes with their visits. I was embarrassed and I was stigmatized. I complained severely to them that I didn’t like what they were doing. Then, one Saturday they visited again, I complained about the pains I was beginning to experience; excruciating pains around my waist. I started praying and asking people to pray for me. Since nothing was done even after the bleeding had stopped, it led to more complications for her because the already dead foetus somehow got rotten in the womb and started a damaging process which led to further complication. Meanwhile, she was still stooling and vomiting and since nobody could dare to touch her, she was left on top of her excretions even when she couldn’t do much for herself due to her weak state. She was given her incisions and other drugs. I wished I was a doctor myself; I would have taken the risk of doing the evacuation because it really affected her. I personally don’t believe in taking medications. I had the mentality that I wasn’t sick. I told the government what I was experiencing. On the day they came to pick me up for treatment, all of a sudden, my temperature went back to normal. The shivering and pains were all gone. So they decided that they would be checking on me. But it got to a point people stopped selling things to me, because of stigma. I was kept in a ward known as the “suspected ward.” The result came out and it was positive. I was then taken to a confined ward. One of the doctors from UNICEF, a white lady told me that they were having issues with the results and that they would have to re-run the tests. They did the tests again and it was still positive. I told them that it wasn’t my result and that I was healthy. I was even doing my usual exercises (press-ups) every morning. I kept telling them that I wasn’t sick. They took my blood sample the third time. That night, they told me that I tested negative in the last result and that I don’t have any reason to remain there. That was how I was discharged. I believe the Holy Spirit healed me. The Sunday after I was released I thanked God on my own. I didn’t go to church or anywhere because of the already established stigma but today I can confidently attend church activities because I guess they all know I’m free now.